The crackle of leaves under your feet, pumpkin patches, the aroma of hot cider, football, the World Series, Halloween, Thanksgiving, and warm breezes changing into cool winds. Ah, the smells, sights and sounds of the fall season! 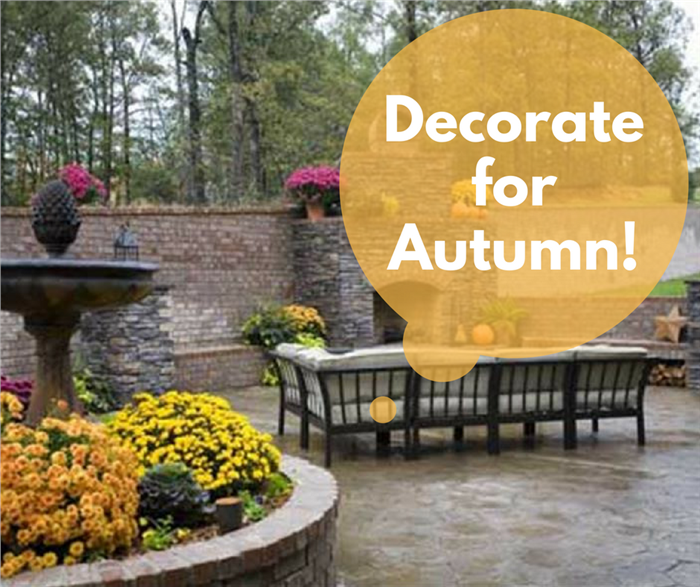 As summer slowly comes to an end, it’s time to celebrate the wonders of autumn with some decorative touches. Display the vibrant colors of fall in your courtyard entry or front yard by planting shrubs and flowers like mums, asters, and sunflowers. With their different shades, these blooms add splashes of color will certainly stop onlookers in their tracks. Stop and look! A gorgeous courtyard decked out with colorful fall flowers and shrubs adds to the charm of this 1-story, 4-bedroom, 4-bath European-style home plan (House Plan #153-1095). With Halloween and Thanksgiving looming in the horizon, do a combination of décor accents that can easily be switched out. 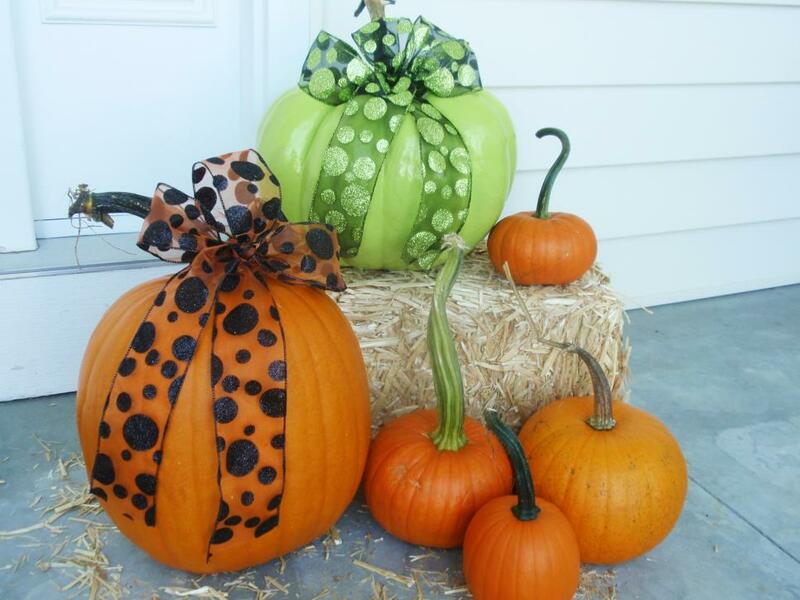 Think pumpkins, gourds, jack-o’-lanterns, flowers, ivy, dried corn, and hay. 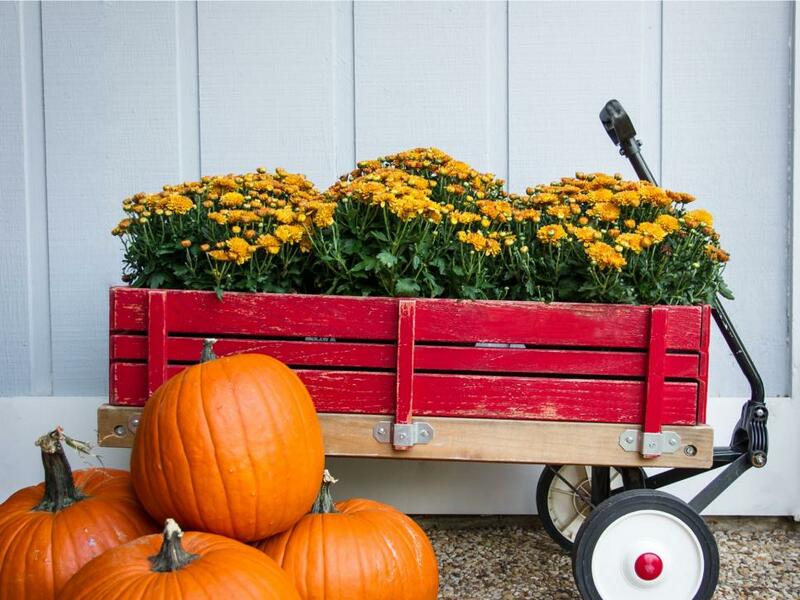 Picture this on your front porch … the golden hues of fall shown off in full bloom in the huge pumpkins and mums in a wagon. Wrap ‘em up in festive ribbons! Large pumpkins adorned with decorative Halloween-themed ribbons and a bale of hay are all you need for another delightful front porch deisplay. 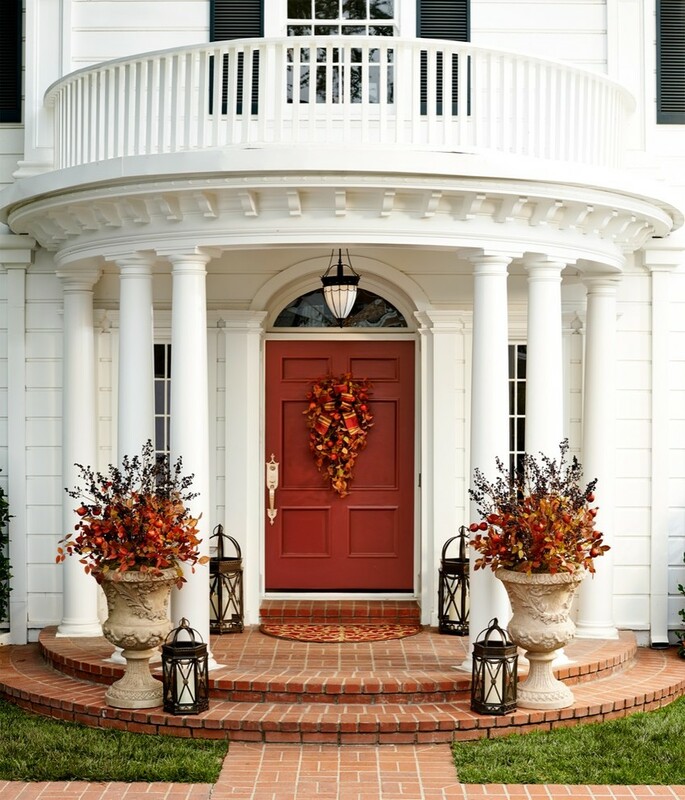 Not everyone has the luxury of having a spacious front porch to decorate – so make use of the front stoop or steps to set up something festive to welcome guests. 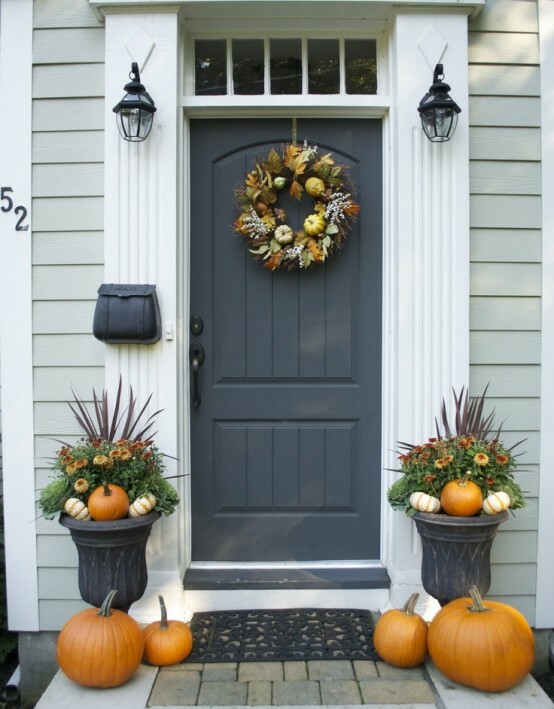 Traditional pumpkin decor is an attractive and welcoming sight at any front door. 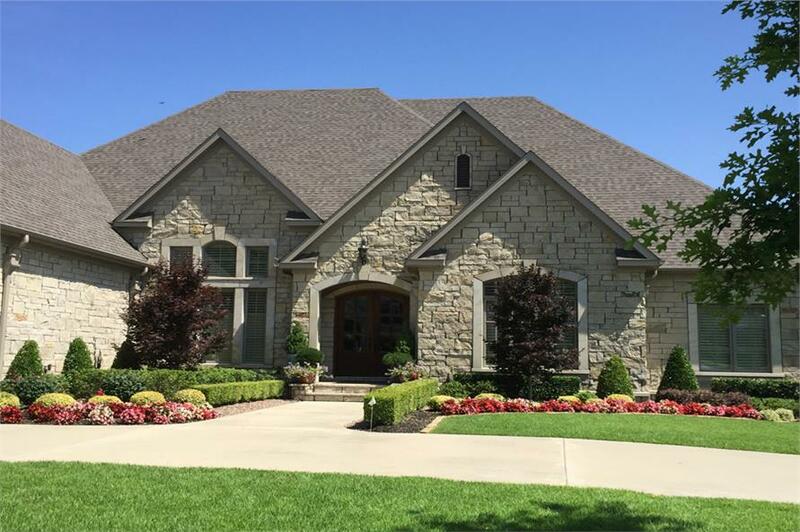 This home features pumpkins on the front step and matching planters featuring gourds interspersed with flowers and wheat stalks. No pumpkins, but fall shades abound in the flowers and shrubs that adorn the front steps of this 2-story, 4-bedroom Craftsman-style home plan (House Plan #153-1781). Here’s a more elaborate take on fall flowers as the highlight of the front steps: colorful blooms arranged inside two huge planters, a fall wreath, and lanterns that illuminate the steps at night. 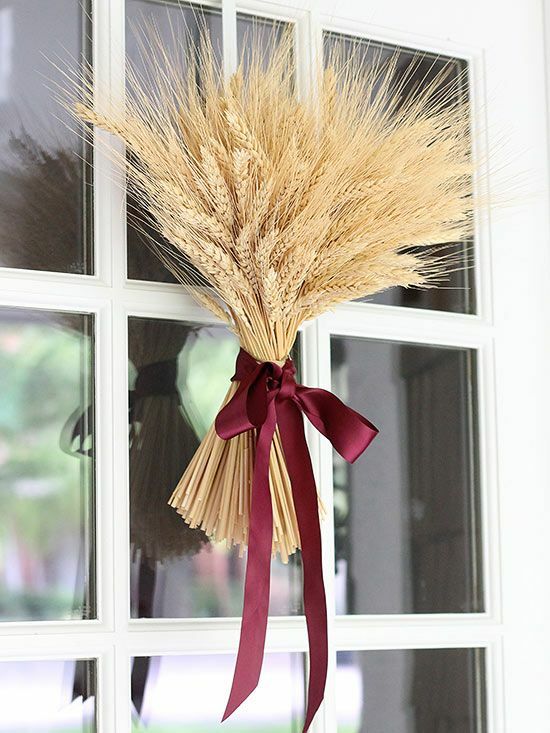 In addition to the conventional fall wreaths and garlands, use other accents like dried wheat and corn, pine cones, and chalkboards for the front door. 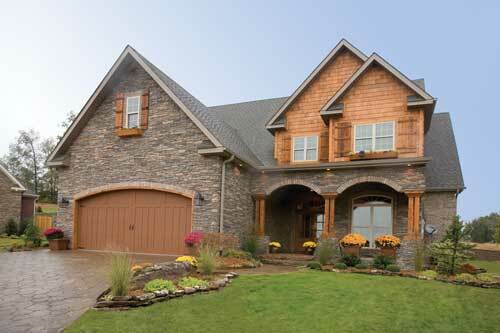 A fall wreath on its front door adds to the idyllic country feel of this delightful 1-story, 3-bedroom Cottage-style home plan (House Plan 142-1123). Finish up your decorations around the home’s exterior with window boxes filled with flowers and leaves of eye-popping colors. 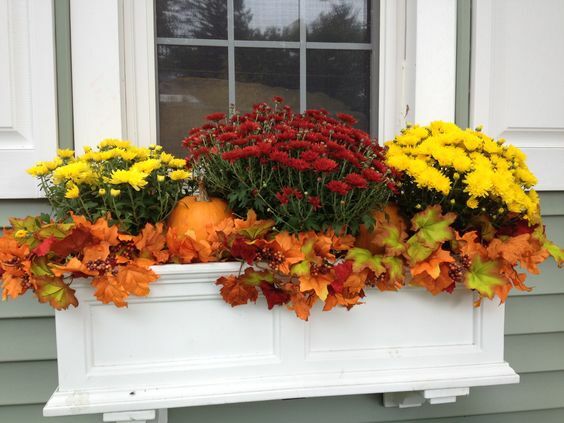 What can be more enchanting than the beauty of nature captured in this window box – a mix-and-match of fall flowers, dried leaves, and pumpkins? 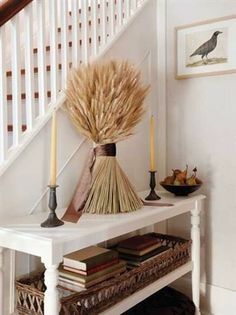 Here are contrasting hallways that reflect the fall season: Left: A simple entryway in muted natural tones, adorned with a wheat sheaf flanked by candles. Right: The more elaborate foyer in vibrant fall colors, accented with garlands on the stairs and lighted pumpkins. From logs to baskets filled with candles and berries to trays with autumn harvest items, transform your dining table into a festival of fall colors and bounty. 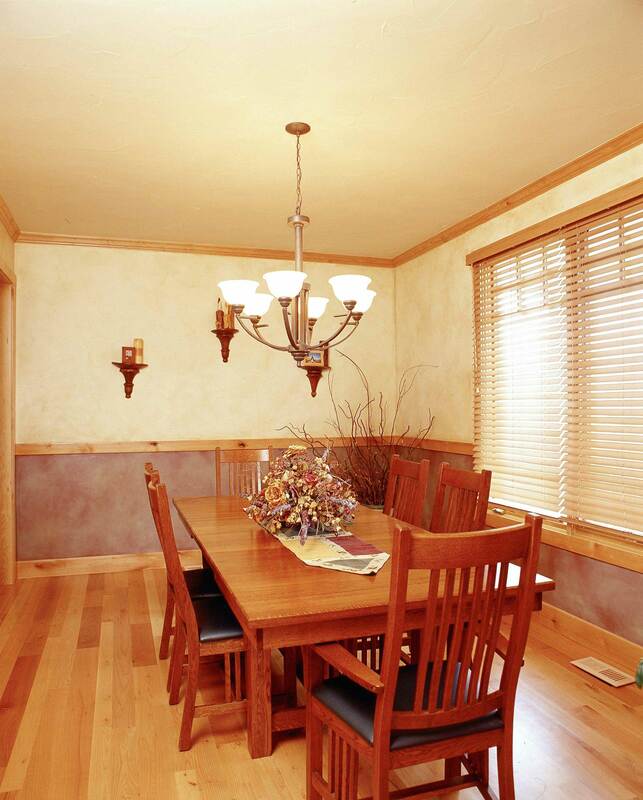 This traditional centerpiece – a colorful flower arrangement – is a simple but striking image on the dining table of a 2-story, 4-bedroom Colorado Mountain-style house (Plan #161-1036). There are different scents to go around. 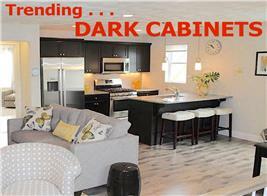 And with a few simple touches, candles are wonderful accents in home décor. Decorative dried berries are entwined in and around custom holders that make the candles – in fall colors – more dramatic. 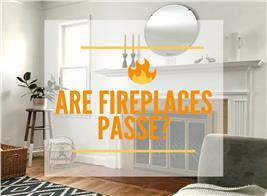 No major renovations are needed to get the bedroom in shape for the fall season. 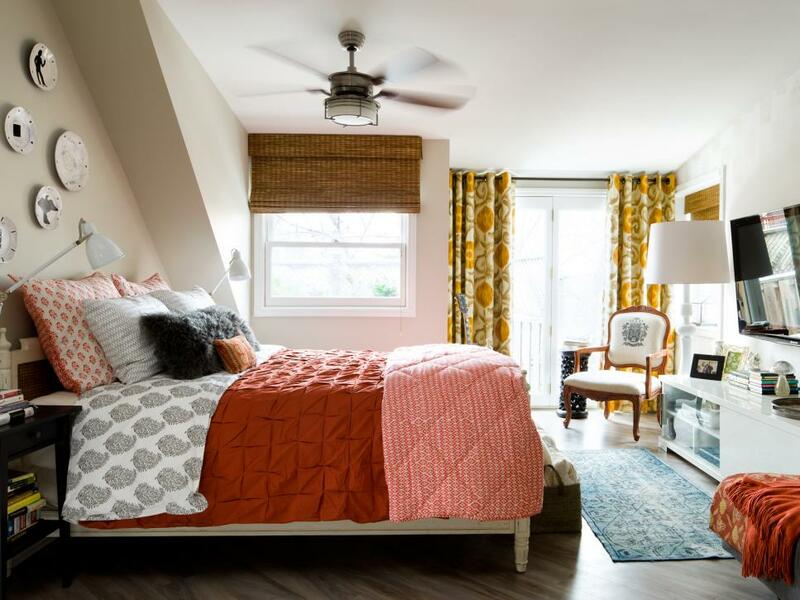 Switch out summer curtains and beddings with the warm shades of fall. Go for oranges, pinks, brick red, and gold. A combination of gold and orange tones gets this bedroom in the mood for the autumn season – and beyond. 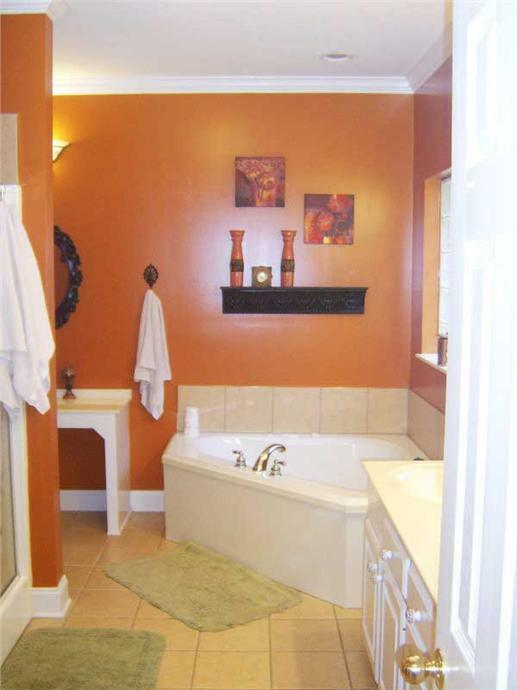 Bring the warm and soothing colors of fall into the bathroom, especially a guest bathroom. Start with a color scheme that reflects the vibrancy of the season (burnt orange or gold). Add dried flowers and leaves to the décor, and your bathroom will be all ready. Perfect for the fall! This bathroom in a 1-story, 3-bedroom Country-style home plan sports warm fall colors – from the wall to the framed art and other accessories (House Plan #141-1180). Nothing speaks of fall and the holidays more than a table setting to welcome family and friends. 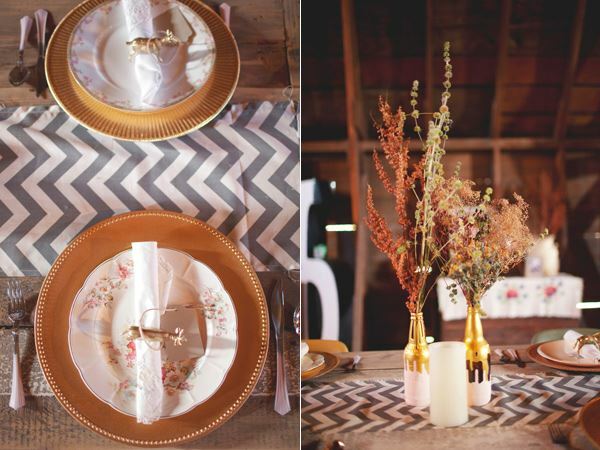 Go from the simple to the rustic farmhouse-inspired to the modern, and, the table setting will still be a hit. Get inspired by the farmhouse style – and set a simple table by using plates and dried flowers in fall colors. Go one step further with your table setting. 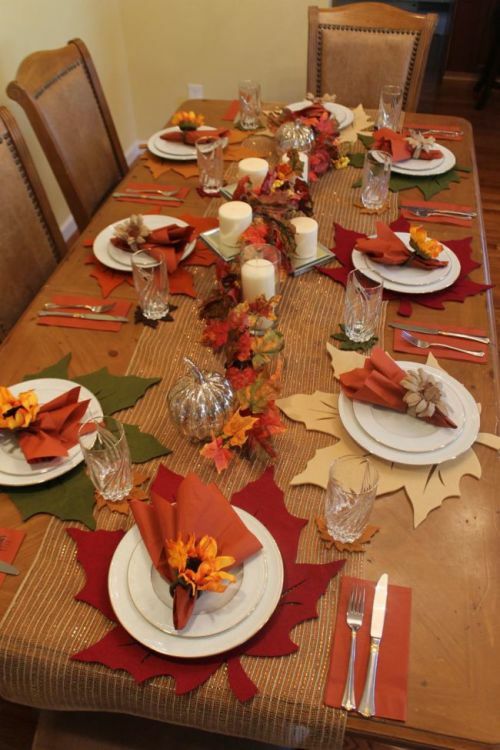 Use place mats, napkins, and a centerpiece of dried fall leaves and candles for a stunning visual effect. 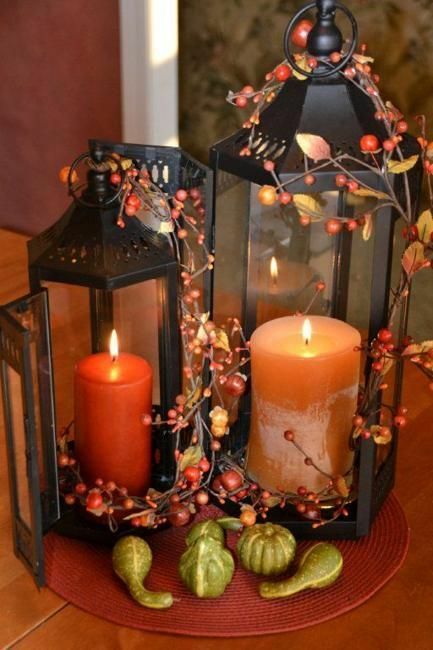 If you’re not too big on Halloween but would still like to get in on the action, mix in a few Halloween decorations with the customary fall accents to put the “magic and spooky” in your home. 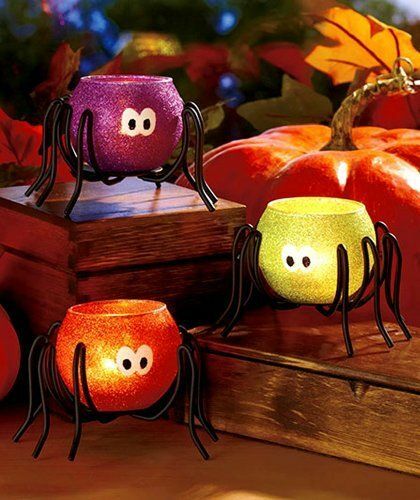 If you want to stay away from jack-o’-lanterns and other pumpkin décor, you can opt to do Halloween spider tea lights. Need more fall spirit as Thanksgiving comes around? 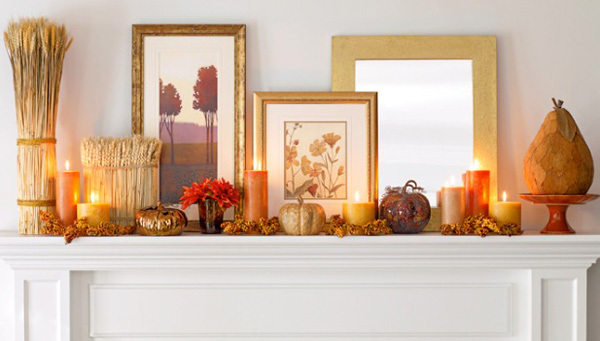 Touch up the fireplace mantel with candles, mini-pumpkins, leaves, flowers, garlands, wreaths, and an autumn harvest. All set for Thanksgiving guests! 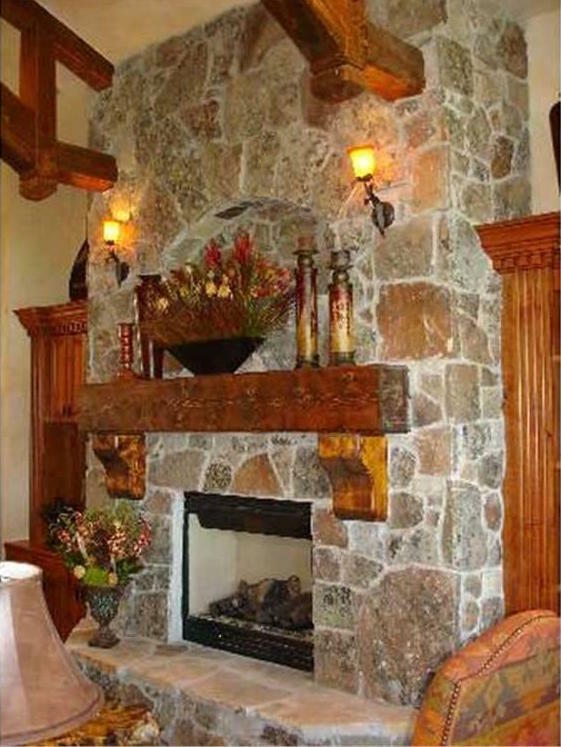 This gorgeous fireplace in a 1-story, 5-bedroom Mountain-style home plan exudes warmth and comfort. The decorative touches include a dried flower arrangement, light sconces, and a planter filled with pine cones (House Plan #135-1018). Everything that's fall is celebrated on this fireplace mantel: pumpkins, autumn flowers, wheat sheaves, and garlands of leaves. What a way to set the Thanksgiving mood! 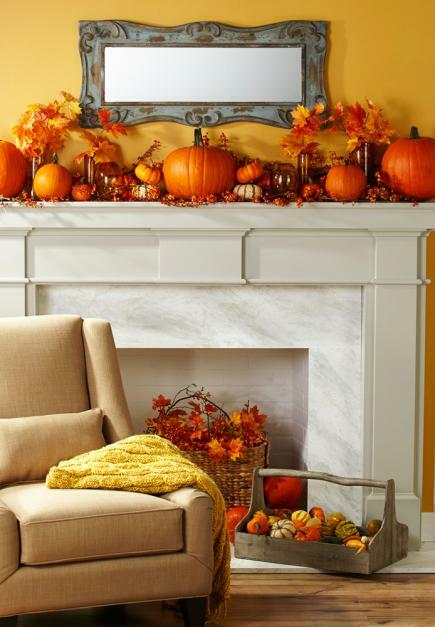 Here’s an attractive fireplace mantel adorned with fall harvest items. As another summer comes to an end, get ready for some easy and terrific “do-it-yourself” projects to make your home cozy and comfortable for the wonderful fall season! Share your ideas in the comments section below. 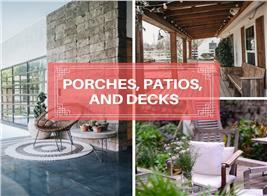 Footnote: The lead image in this article features the beautiful rear patio of a 2-story, 4-bedroom Craftsman-style home plan – with its simple but delightful arrangement of colorful autumn flowers around the space. 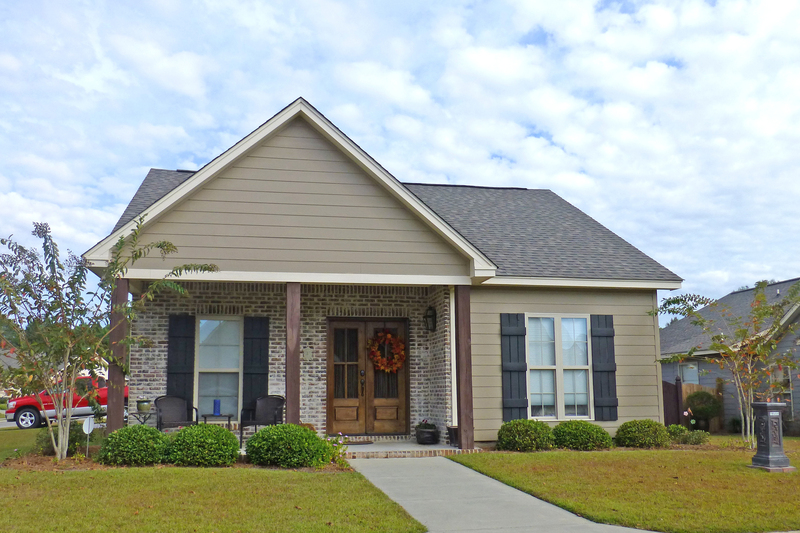 For more information, click here (House Plan 153-1781).